The website of the Association of Substitution Therapy Advocates of Ukraine [ru] recently published an article where an activist Yekaterina Slavskaya speculates about the current state of affairs and the future of the Association. The Association of Substitution Therapy Advocates was founded at the beginning of 2009 and currently it unites 76 people living with drug addiction who are substitution therapy patients from various regions of Ukraine. The goal of the Association is realization of social, economic, medical and other rights and freedoms of its members. The website of the Association also serves as a platform where the members can share their stories and ideas on various topics including the directions of development of the organization. Легко выражать своё мнение, когда живёшь легальной жизнью. Оглянитесь вокруг, посмотрите на декларируемые государствами результаты «борьбы с наркотиками»: количество получивших помощь в медицинских учреждениях за 2008 год – около 60 000 человек, а количество людей, которым «помогли» в милиции более 170 000 человек .Цифры показывают – что у нас происходит борьба с наркоманами, а не с явлением – наркомания. It is easy to express your opinion when you have a legal status. People living with drug addiction were considered by the government and medical personnel to be marginal or even criminal. Even if they had their opinion, they did not have an opportunity to express it. Government officials are men and women who read regular newspapers and watch regular TV which form negative attitude toward drug addicted people. Just look around, examine the ‘results’ of the ‘fight against drugs’ declared by the government: the amount of drug addicts who received the services in medical establishments in 2008 was about 60,000 people, the amount of those who received ‘services’ of the police was 170,000 people. These numbers show that the phenomenon is that the is a fight with drug addicts and not with the drug addiction. According to Yeakaterina, the main focus of the Association should be changing this situation and changing the attitudes of the society toward people living with drug addiction. Открытием 2009 года для нас стала встреча на тренинге «Значимое участие» в г. Софии, Болгария. Активисты стран Восточной Европы и Центральной Азии говорили о своих планах и задачах, делились опытом. И наша ВОО «Ассоциация участников ЗПТ Украины» стала одним из примеров эффективной адвокации и усиления влияния сообщества ПИН/ЗПТ на ситуацию в стране. …за выполнениями программ мы всегда помним о том, что нам необходимо учиться, привлекать людей, настраивать новые информационные каналы и создавать новое общественное мнение о людях, участниках программы ЗПТ. Нам помогают технические эксперты и консультанты, удивительно талантливые и понимающие люди. И всё же наблюдается нежелание партнёров ставить свои организации в один ряд с Ассоциацией ЗПТ. С одной стороны, информация, заявления на милицию, истории успеха и фотографии запрашиваются через день. С другой стороны, я не нашла имени нашей организации ни в одном информационном сообщении партнёров за последние 4 месяца. В сообщениях, в которых использовалась информация, которая предоставлена … членами Ассоциации ЗПТ. The meeting during the training ‘Meaningful participation’ in Sofia, Bulgaria was an eye-opener for me. The activists from Eastern Europe and Central Asia discussed their plans and goals and shared the experience. 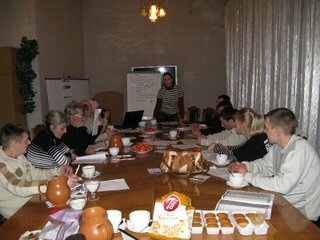 And our Association of Substitution Therapy Advocates of Ukraine was one of the examples of successful advocacy and of an increase of the influence of substitution therapy community on the situation in the country. …while implementing programs, we always remember that we need to learn, attract new people, build new communications channels and work on changing the public opinion on substitution therapy programs participants. We receive assistance from experts and consultants, who are amazingly talented and apprehensive. Although a reluctance of the partners to put their organizations on the same level with our Association is still observed. From one side, every other day we receive the requests on police claims, pictures or success stories. From the other side, I have not found the name of our organization in any of information released in the last 4 months. Even if the information provided by the members of the Association was used in the releases. Yekaterina also believes that more active participating of members of the community in the work of the association would also help the association to move forward. You might remind me that when you have problem, rather than look for other reasons you would better, look in the mirror. And I would agree with you. Among the 6000 substitution therapy patients in 2010, there were only about 80 activists. This is just a little bit more than 1.3%. At the end of her article, Yekaterina analyses all 5 known differences between a community and an NGO. If a formal organization is rational, the community is more intuitive. If a community is built around an idea, the organization is built around a Mission. If the organization is responsible for its reputation, the community is responsible for the idea. Establishing a community is a unique process of transformation of ‘I’ into ‘We’, establishing an organization is the process of hiring of personnel. The basis of a community is volunteers; the main value – is independence in action, the main strength – the honesty. The basis of the organization is its statutes, the main value – is reputation, the main strength – technical and financial resources. Организации и сообществу для эффективной работы следует идти вместе, дополняя друг друга :).